Keeping teams organized throughout the app development process can be a challenge, often requiring one platform to send messages, another for conducting virtual meetings, and a separate software for task management. This approach can become unwieldy when working with larger teams, particularly those spread across time zones. On Tuesday at the Cisco Collaboration Summit, Cisco revealed the first set of APIs for its new Cisco Spark platform, a team messaging application which allows users to send messages, files, and conduct video conferences. With the announcement of the new Cisco Spark APIs, Built.io Flow has integrated Cisco Spark into its integration-as-a-service platform. Cisco Spark is similar to other team collaboration based messaging platforms such as Slack or Glitter, both of which allow teams to chat in individual rooms and send files. Spark adds connectivity to other developer collaboration platforms, improving upon other offerings by integrating the Cisco Spark APIs with Built.io Flow. 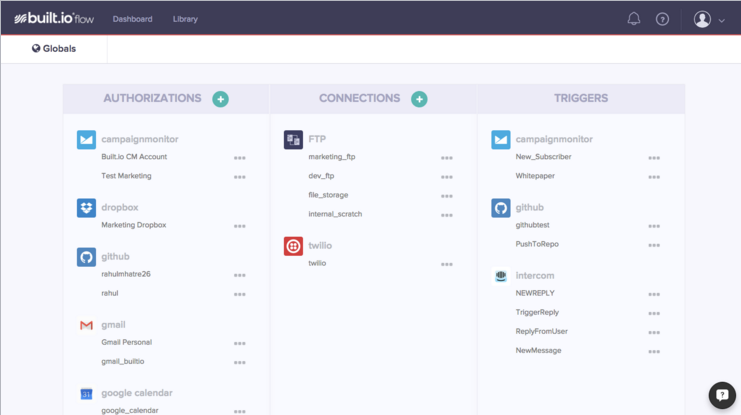 Built.io Flow is an integration platform which takes commonly used services and utilities in development and marketing and connects them with a company’s data center or application. 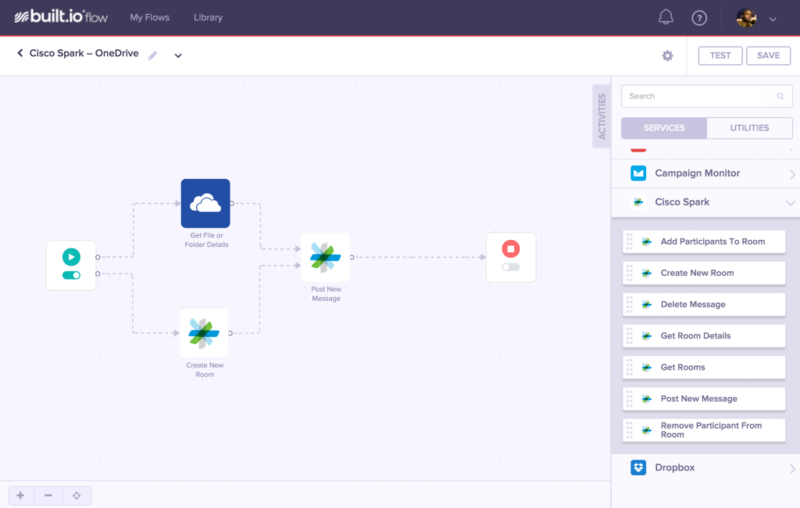 With Built.io Flow, users of Cisco Spark can create workflow pipelines, known as flows, for a variety of use cases. Example workflows can include setting up a flow with sales-related software services such as Marketo, Cisco Spark and Salesforce which will trigger messages to be sent to one’s team if there is sales data which needs to be acted upon. Other example use cases could be streamlining a team’s development pipeline with Spark, GitHub, and other APIs as deemed prudent for one’s project. Working with Built.io Flow and Cisco Spark eliminates the need for users to have to set up multiple communication and collaboration tools to get a task accomplished. Built.Io Flow features a simple drag-and-drop interface, allowing users to customize their workflow by dragging the APIs of their choice into a flow. They can then further customize the workflow by setting triggers, ensuring that tasks are carried out automatically without having to log out and log into the other tools. As Built.io Flow operates both in the cloud and through legacy gateways, those using private data centers are assured their data is secure while using Built.io Flow. Built.io Flow offers an enterprise gateway which connects legacy firewalled systems to not only other legacy systems but services and utilities in the cloud. Cisco ensures the safety of the communications channels with the third party software by using end-to-end encryption coupled with in-transit media encryption. 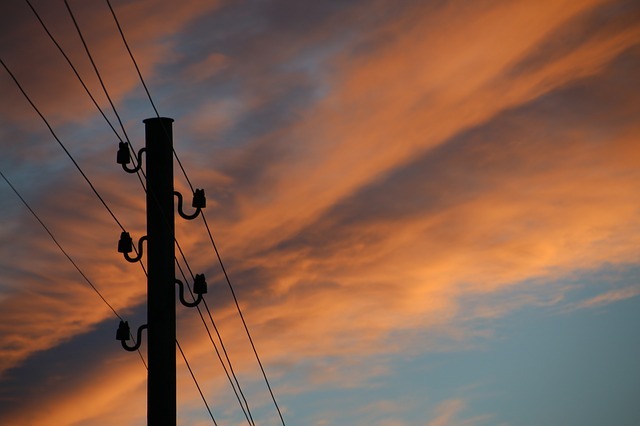 This ensures that data sent and received is secure not only when it is deployed and collected, but throughout its time being sent over a network. Built.io Flow’s technology further boosts the security by destroying underlying containers after the contents are no longer needed. By terminating containers upon process completion, they are made unavailable to malicious attacks such as packet spoofing. Cisco Spark offers software development teams a way to not only collaborate, but develop better work practices by implementing workflows. Built.io Flow allows for a level of customization that is able to adapt to the ever-changing needs of the enterprise, offering APIs to suit a variety of use cases. Cisco Spark offers the possibility that more can be accomplished by reducing the time spent ironing out how to bring a team together.